Haven't you dreamt that floating on the lake, on a Canadian canoe to fly fish? I have. I learned how to build a real canoe by planking cedar strips but unfortunately I do not have such wide a workshop and the lake to float the canoe near by. 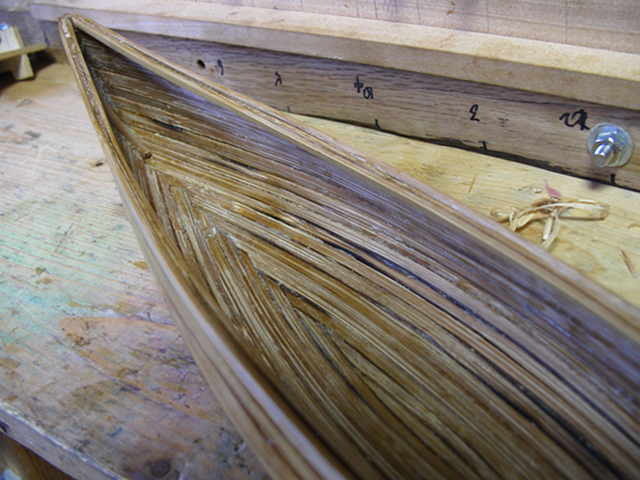 So, I made up my mind to make a miniature canoe using bamboo strips instead of cedar strips. That was a really good idea to use bamboo strips because I have so many wasted strips of Tonkin cane which came out from making bamboo rods. The following method of making a canoe is almost same to the one of making a real size canoe. The differences are the size, material and as a result, how to glue the strips to each other. At first, draw the plan on design paper what you want to make and get necessary sizes from the plan, such as the length, width and depth, shape, etc.. This plan can be used when making a real size canoe too. My molding is made in replaceable manner by grooving the strong back (base) and sliding the panels into the grooves so that I can make a different shape of canoe in future. Blue masking tape is attached so that the planked strips should not glued to the molding. I used wasted Tonkin bamboo strips. Split the strip in paralleled to its enamel surface. The thickness is from 1.5 to 2.0 mm. Further I planed the strips on the wooden planing form by grooved plane to keep all the strips in the same thickness. Starting at the side, plank a paired strips on both side of molding. I used several types of epoxy glue. As I had to wait the next planking until the previous strip is dried, 5 minutes and 90 minutes set up types are also used. Easy part is glued by the shortest time set up epoxy. The following pictures show how to proceed the planking. The width of a pair of strips should be planed to the same size..
Planking is the key to the success. I used every possible method to press the strips together such as clips, strings, and wires. 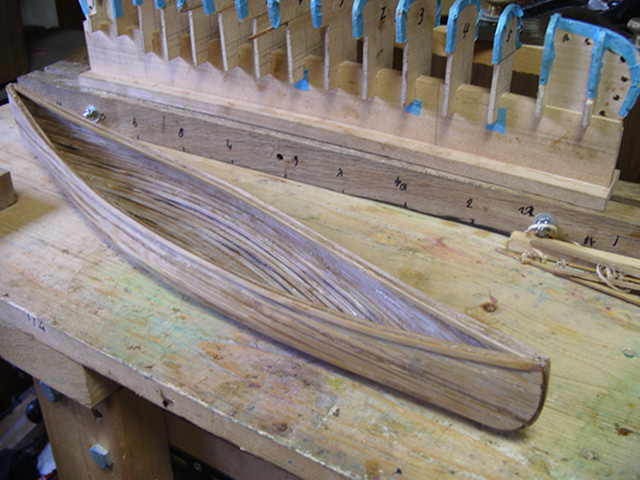 For curved portions, the strips were heated and bent before glued. As gluing a flat and straight strips above the surface of curved molding, it is necessary to adjust the angle of glued surface. It is so difficult to just fit the glue surfaces. 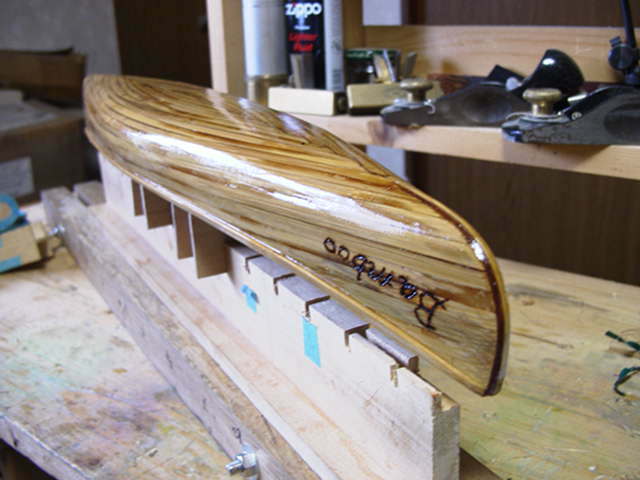 In making a real canoe, it is rather easier to plank the wooden strips to each other by using nails or vises. Further, in real size, the sides of a strip can be mortised by router bits for a solid matching to each other. It cannot be avoided to have gaps between strips in miniature case. I filled a past which is made from epoxy and wood powder. The photoes are after sanding. I could plane the outside of the canoe but I couldn't the inside because too narrow. So, the inside of the canoe is not smooth. We can sand the inside either by plane or sanding tools in making a real size canoe. These pictures are inside of the canoe. That is all right since this is a miniature, no one gets in. 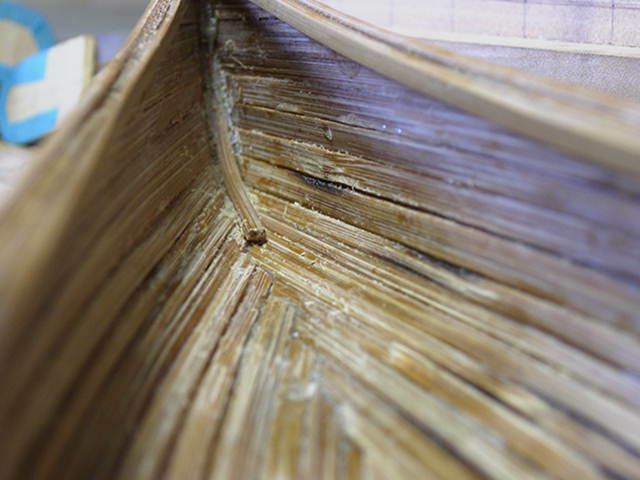 In real canoe making, glass fiber cloth is pasted with FRP over the canoe but it is obviously needless for a miniature. After filling and sanding the outside surface, I put a coat of 90 minutes epoxy and another coat of polyurethane after putting the name. Left: The name of the canoe, "Bamboo" was burned using electric soldering iron. Right: York, deck, bow and stern seats were made by Tonkin either and fixed to the canoe. 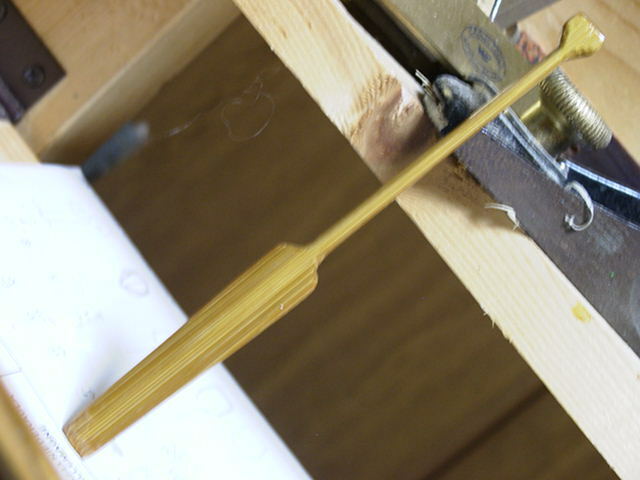 One tenth paddle is also made from Tonkin strip. Completed on October, 6, 2004.